A picture we wanted to share. 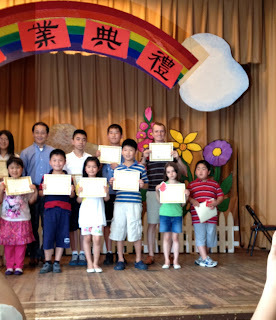 Our family is learning Chinese on Saturdays at Huaxia Chinese School in Verona, NJ. Our daughter Elena is in Chinese as a Second Language Class. Pablo and Cristina are in a “Mommy and Me” class, Franck is in an adult class. Elena finished the year with the reward of #1 Most Outstanding Student in her class. We are obviously very proud of her efforts throughout the year. Especially since nobody in our family is a native Chinese speaker. We thank all the volunteers and teachers at the school who inspire children to learn Mandarin. Wǒmen xǐhuan xuéxí pǔtōnghuà!